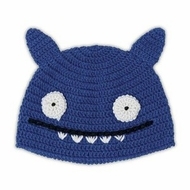 Wait, so you don't have the Uglydoll Hat - Blue already? You know how the teacher would say let's put our thinking caps on? Well this is the other kind of cap. Sort of. In a good way. See, in the Uglyverse, UGLY means being yourself and expressing your true inner being. So take off your thinking caps and join in on the fun. Yes you...HEY UGLY! Measures Approximately 7.6" x 6.5"